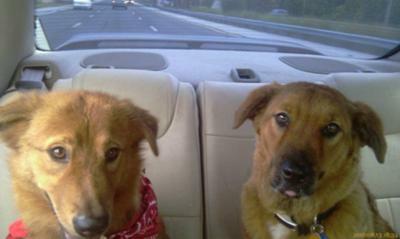 Misha & Lacey in the car for the 1st time. 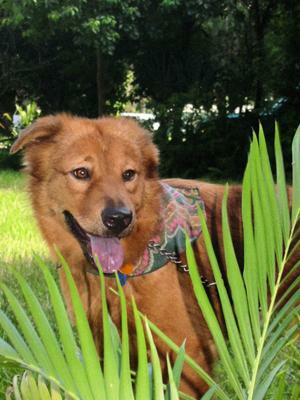 Lacey's history is a mystery as my friend Les sprung her from death row of the Orlando Animal Shelter. Lacey was labeled as being "fearful" and basically regarded as unfit for adoption. Les saw something in Lacey making her worth ignoring the advice of choosing another dog. I'm glad he did too. Lacey does still have some fear issues with me which could change over time. She has really bonded with Les as she should. Lacey likes dog parks especially with a water feature, car rides, Misha, our daily walks and sleeping. 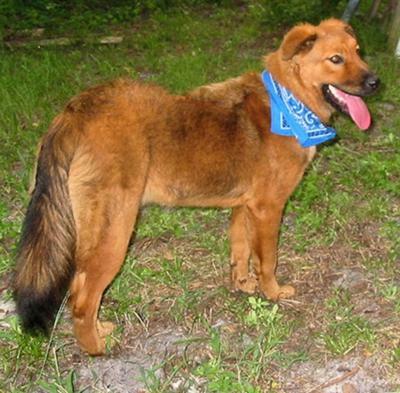 Misha was adopted as a puppy with another owner who sadly had to give her up because of a move. Sad for them, happy for us. She likes people more then other dogs, not counting Lacey as they are best of friends. Misha likes everything Lacey likes, though she would rather chase squirrels than other dogs. Nothing like young prey drive to keep one alert on leashed walks. Lacey is about 2 years old and Misha is 9 months old. We love both of them and they have added more happiness to our lives. How wonderful that you saved a dogs life! Great story! Join in and write your own page! It's easy to do. How? Simply click here to return to Getting to Nose You.